Children - Psychic ability - Case studies. Do your children utilize all of their senses? "All children are naturally born with a basic sixth sense. It is the primary way in which we all first relate to the physical world. Consciously used as learning tools these intuitive/psychic talents can aid in communication, social interaction, compassion, and creativity. They add a spiritual dimension and depth that help all children grow to become productive, loving, and wise parents, teachers, brothers and sisters, and friends." Are your children learning all they can in school? Most teachers emphasize facts and figures, which may challenge children's intellectual skills but do little to encourage or enhance their innate instinctive abilities. 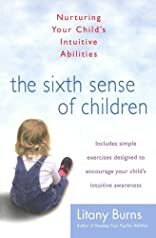 In The Sixth Sense of Children, world famous psychic Litany Burns will show you how to identify the traits your children naturally possess and help nurture their development. About Litany Burns (Author) : Litany Burns is a published author. Published credits of Litany Burns include The Sixth Sense of Children : Nurturing Your Child's Intuitive Abilities.